Ad-supported applications are a major concern for security analysts everywhere, because most of the time the programs do not appear to be malicious. Majestic Coupons is an application that you ought to remove, because it displays irritating advertisements that come in various shapes and sizes. And the content featured on the ads is suspicious as well and is constantly subject to change, since its developers may include new and exclude old ads at any given time. The fact of the matter is that its developers are likely to make business agreements with shady advertisers and website owners, because all they care about is making money. So join us as we unravel fact from fiction surrounding Majestic Coupons. The way this application is presented and how it works in real life will become very apparent once you start using it. It must be said, however, that this application has not been released yet. It developers, who want to remain anonymous for obvious reasons, have a tradition of setting up a program’s website first and releasing the actual program second. We base our assumptions and reasoning on encounters with previously released applications that are almost identical clones. You might say that Majestic Coupons is just a new name for an old program that has been around for quite some time now. You might be interested to know that this program’s previously released clones are called PriceChomper, Ninja Savings, and ProShopper. Of course, this is not the complete list, as it would be impossible to fit all of the names in one article. As far as this program’s distribution methods are concerned, we know only of one method that this application will use. Its predecessors were bundled with malicious software installers, and we think this will also be the case with Majestic Coupons. The shady freeware websites that feature these bundles vary, so, regardless of your preferred freeware distributor, you should always go for custom installation settings to see if there is any potentially unwanted content that you might want to remove. We have found that this program is currently advertised on Majesticcoupons.com. This website features the typical cheap promotional lines we find on every adware-promoting website. 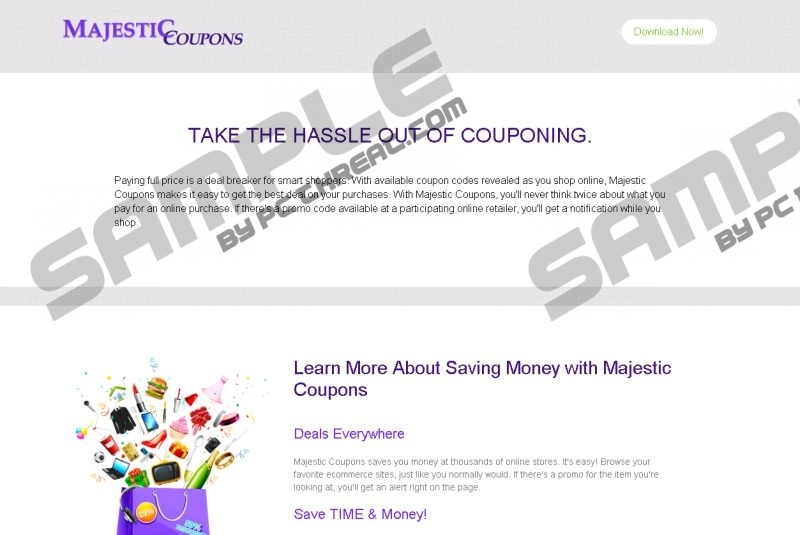 The website says that Majestic Coupons has been created to benefit you by providing you with commercial advertisements. These ads come in various shapes and sizes. This program’s website features an End User License, which indicates that Majestic Coupons can display sponsored links, banners, pop-unders, interstitial ads, coupons, video ads, and in-texts. It must be noted that some sponsored links may appear in the results of Bing and Google, so determining which content is legitimate and which must be scrutinized is not apparent. The bottom line is that this application is bound to display irrelevant and even unreliable content. Some ads can redirect you to shady online retailers or to websites that host downloads of potentially unwanted programs (PUPs). So there is no justification for keeping this ad-supported program. Regardless of what its promotional campaign says, this application is bound to put your computer’s security in jeopardy once it is released. To say that you will definitely get your computer infected with malware or that you will be tricked by fake retail websites would be an overstatement. However, there is a small chance of this happening; you just cannot know when its developers will start working with murky advertisers. Locate Majestic Coupons and Uninstall it. Find the program and double-click on it. Type Control Panel and enter it once it is found. Locate the unwanted software and Uninstall it. Quick & tested solution for Majestic Coupons removal.